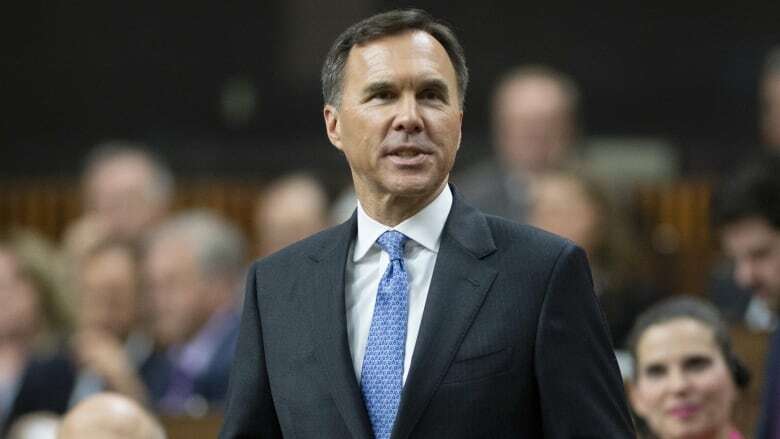 Finance Minister Bill Morneau tabled a pre-election budget today designed to calm Canadians worried about retiring with financial security, getting the skills they need to land new jobs, or being able to afford a first home. Morneau's fourth budget — a springboard for the Liberal platform heading into the fall election campaign — delivers few big-ticket, signature programs but offers several new lower-cost programs that target key electoral constituencies: millennials, workers, businesses and seniors. "There's a growing sense of uncertainty taking root around the world, and Canada is not immune to those worries," Morneau said. The minister was scheduled to deliver the speech just after 4 p.m. ET in the House of Commons after the markets closed. But the Conservatives — outraged by the Liberals' decision to shut down the Commons justice committee's study of the SNC-Lavalin affair instead of recalling former justice minister Jody Wilson-Raybould to testify — delayed it by dragging out a vote on a motion about MP travel. Morneau tabled his budget and left the House without giving the speech. When he eventually returned and rose to speak, opposition members tried to drown him out by banging on their desks. The thumping and shouts of "let her speak" and "coverup" were so loud that people gathered in the public gallery could not hear what Morneau was saying. He carried on with his speech; the Conservatives eventually staged a walkout from the chamber as he spoke. In all, the budget offers $22.8 billion in new spending. The budget's single biggest investment is in Indigenous services and Crown-Indigenous relations: $8.1 billion over five years for services to improve children's health care and end boil water advisories on reserves and to settle land claims, among other measures. A national pharmacare program has been a marquee Liberal promise for years. This budget doesn't earmark significant money to create one — but it does set aside $35 million to create a Canadian Drug Agency that will build on work already done by provinces and territories on bulk drug purchases and negotiate better prices for prescription medicine. There's also $1 billion to help Canadians with rare diseases access the high-cost drugs they need, though that money doesn't kick in until 2022. The budget targets two major voting blocs: millennials and senior citizens. Morneau said many hard-working young people see buying a home as an "impossibility." The government wants to change that with a new shared mortgage program that could offset the purchase price by up to 10 per cent. The budget also boosts the amount that can be withdrawn from RRSPs for a first-time home purchase — to $35,000 from the current $25,000. Low-income seniors will see changes to the Guaranteed Income Supplement which will allow them to keep more of their income if they choose to stay in the workforce. The budget also introduces safeguards to protect pensions in the event of company bankruptcies, and offers supports to community projects that improve the lives of vulnerable seniors. "Women and men who have worked hard their entire lives … deserve a secure and dignified retirement, free of financial worries," Morneau said. Morneau's 460-page budget, titled Investing in the Middle Class, offers no timeline for erasing the deficit. The Liberals had pledged to run deficits to finance a massive infrastructure program, but broke their promise to return to balance by 2019. Former Saskatchewan finance minister Janice MacKinnon predicts that could be a problem for many voters. "I think this one is going to go beyond the numbers to a trust issue. It was a fundamental promise of this government to handle finances carefully, limit deficits and balance the budget," she said. "They've broken other promises, (like) electoral reform, but at least they tried. They gave it a shot. There was never, in the term so far of this government, an attempt to restrain spending." The budget projects a $20-billion deficit next year, which is scheduled to fall to $15 billion two years later, then to $10 billion in 2023-2024. Morneau said Canadians are also nervous about the labour market and the mismatch between their skills and those employers are seeking. The budget introduces a new, non-taxable Canada Training Benefit designed to help Canadians plan and pay for skills training. It includes a benefit with income supports covering the worker's training period. "Canadians at all stages in their working lives should have the opportunity to learn new skills to take control of their future," Morneau said. But MacKinnon said there's no data to show exactly which skills are being sought by emerging job sectors. She said the government has failed to collect that crucial data, leading to a "mismatch" between skills training and what employers need. 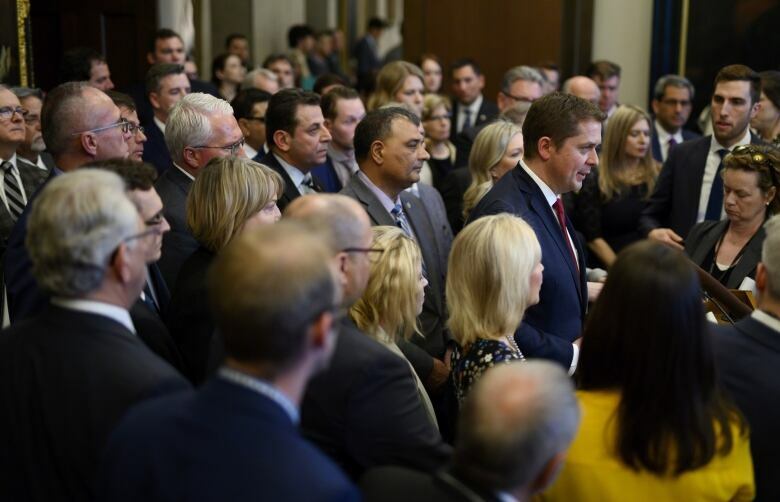 Conservative Leader Andrew Scheer said the budget has no legitimacy, arguing Prime Minister Justin Trudeau is spending tens of billions of dollars on a desperate attempt to distract from the SNC-Lavalin scandal that has engulfed his government for weeks. "This is the most expensive coverup in the history of coverups," he said. "Deficit spending today, to cover up a scandal, to be paid for by higher taxes after the election." Scheer said his caucus members walked out during Morneau's speech to make a point. "It is not business as usual, and we could not stand by and pretend otherwise," he said. The creation of dedicated real estate audit teams at the Canada Revenue Agency to tackle tax non-compliance and money laundering in the housing market. An additional $739 million over five years to repair water systems on First Nations reserves. $1.2 billion over three years to help First Nations children access health and social services. A commitment to ensure access to high-speed internet by 2030 across the country. A federal purchase incentive of up to $5,000 for electric battery or hydrogen fuel cell vehicles with sticker prices of less than $45,000. Working with the Federation of Canadian Municipalities to offer funds to support retrofits, such as hot water systems or rooftop solar panels, that make homes and businesses more energy efficient. As he rolled out his budget, Morneau also took time to tout the government's past accomplishments, including the Canada Child Benefit that he said has helped to lift 280,000 children out of poverty. He said the federal government's "historic investment" in infrastructure has funded 33,000 projects and created well-paying jobs across the country. 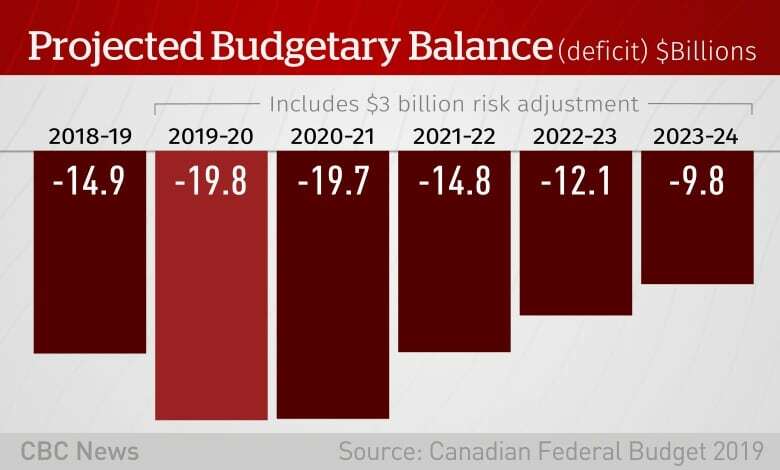 In a news conference, Morneau defended the government's decision to continue running deficits, arguing the Conservative plan to "balance the budget at any cost" would mean deep cuts that harm Canadians. "We are convinced that if we took their approach, we'd be back in the situation in 2015 that they left us with — stubbornly high rates of unemployment and, as we came into office … two quarters of negative growth, which economists will tell you is a recession," he said. NDP Leader Jagmeet Singh said the budget does nothing to build much-needed affordable housing, and suggested the RRSP measure will be of little help since most millennials haven't stashed that much away. "How many millennials ... have enough in their RRSP to buy a home? It shows how disconnected Mr. Trudeau is with respect to what Canadians are going through," Singh said. Sahir Khan, executive vice-president of the Institute of Fiscal Studies and Democracy at the University of Ottawa, said it's hard to give credit to any one government for a strong economy, just as it's not always fair to blame a government when the economy goes sour. "I think they've made certain investment decisions, certain expenditure decisions that should position Canadians for the economy going forward, particularly an innovative economy," he said. "But this budget isn't it. I think this is a fairly modest budget that is politically focused and moves their agenda forward, but not in a particularly ambitious way. It's a way that focuses on the upcoming election." This story has been updated from an earlier version to clarify that the budget includes $8.1 billion over the next five years for programs under Indigenous Services and for land claims and other initiatives under Crown-Indigenous Relations.